My room was 20 degrees F this morning, so maybe it is time to explain the guest houses on the circuit. Most are built of stone, many are three stories, with the rooms opening out onto wooden galleries. The rooms are not heated, usually they have wood or concrete floors that are sometimes swept. The bunks have thin mattresses that remind me of camp, and in higher altitudes they also have large blankets of varying cleanliness. The beds have linens but they do not change them– carrying a sleeping bag is a good idea. Usually the toilet is down the gallery and it the usual porcelain footprint over a hole. You flush with a bucket of water. The kitchens are often on the second floor, very dark, low and covered with soot as they usually cook on wood stoves. All hotels have a large dining area, usually with benches or plain chairs and bare tables (though some are covered with rugs). Those rooms have a lot of windows, though like the ones in the rooms, they are single paned wood sashes, usually with a lot of air blowing through. The windows tend to be covered with stickers advertising various trekking agencies and the like. People tend to gather in these big common rooms though they are also unheated and usually freezing until late afternoon when they light the stove for a few hours. The higher the altitude, the lower the buildings tend to be, and the less heat as there is less wood and animal dung, and of course higher altitudes are also much colder. I’m looking forward to crossing Thorung pass and heading back down to warmer altitudes. Spent the morning at Base Camp Hotel talking to Kumar and Kit and watching last night’s snow melt. The trekkers who had stayed one town downhill started rolling in mid-morning, many familiar faces. 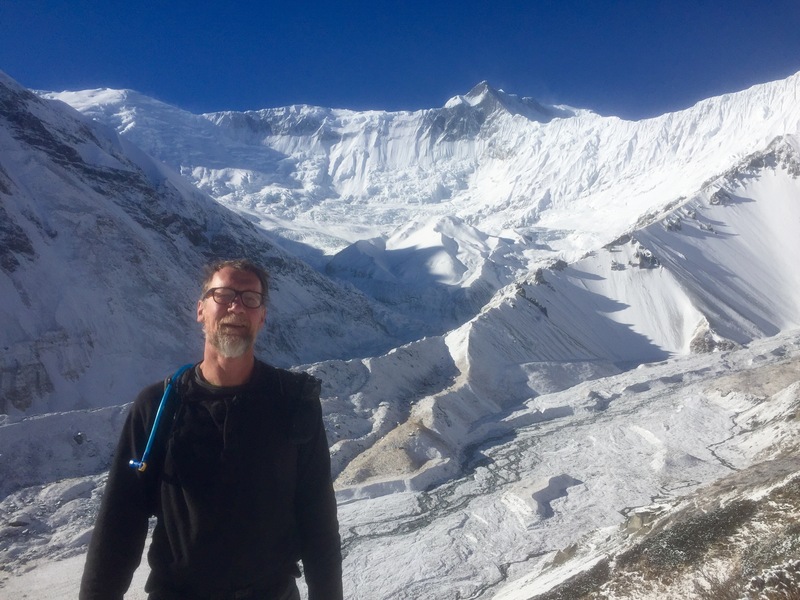 Will, Kyle, and I left about noon for a short hour’s hike up to High Camp, which gave us another 500 meters acclimatization before crossing Thorung La tomorrow. A long cold afternoon in the common room with, at 4:00, a press of people huddled around a small, smoky woodstove. Early dinner and early to bed just to get warm. Also very tired of the lengthy, detailed discussions of how to get over a 5400 meter pass without suffering from altitude sickness. The height is making me dizzy, tired, and cold, but I will be glad to be back to quiet trekking away from such anxiety.